This minimal, athleisure boutique is your one-stop-shop whether you're in the market for a pair of geo-print yoga bottoms to do actual yoga in, or you just don't feel like wearing real pants to Starbucks. 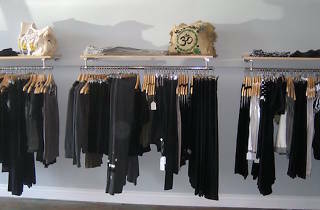 The boutique is stocked with photogenic fitness fashions for both men and women from Vuori striped board shorts and strappy triangle bras from Onzie to fun slogan tanks from YogaRX (who doesn't want their racerback to read "Heavily Meditated?"). Positioned under a bright, sky-blue awning on Manhattan Ave, you couldn't miss its punny title no matter how fast you power walk by.